For thousands of years, human beings have created paths known as labyrinths for reasons ranging from blessing to pilgrimage and healing. Diana Stork played her harp at the first labyrinth walks at San Francisco’s Grace Cathedral in 1991. Over her many years of playing at labyrinths throughout the world, Diana has composed and improvised a large body of music inspired by these sites and the people who move through them. 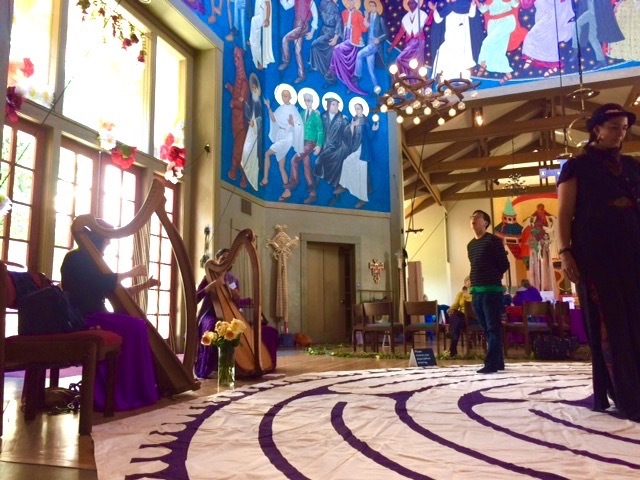 Diana offers the unique experience of walking the Labyrinth to harp music. Harp music always adds a deepening of the labyrinth experience. Her harp music can be played at churches, hospitals, schools, parks, and wherever there are labyrinths. Her performances can be experienced as musical concerts inspired by Medieval, Celtic, classical and even jazz improvisation styles, and also as inward journeys of healing and meditation. Diana is a certified Veriditas – trained Labyrinth Facilitator, trained by Lauren Artress, the Founder of the modern labyrinth movement. Diana Stork offers her music with sensitivity and compassion–bringing light and love at this special time. 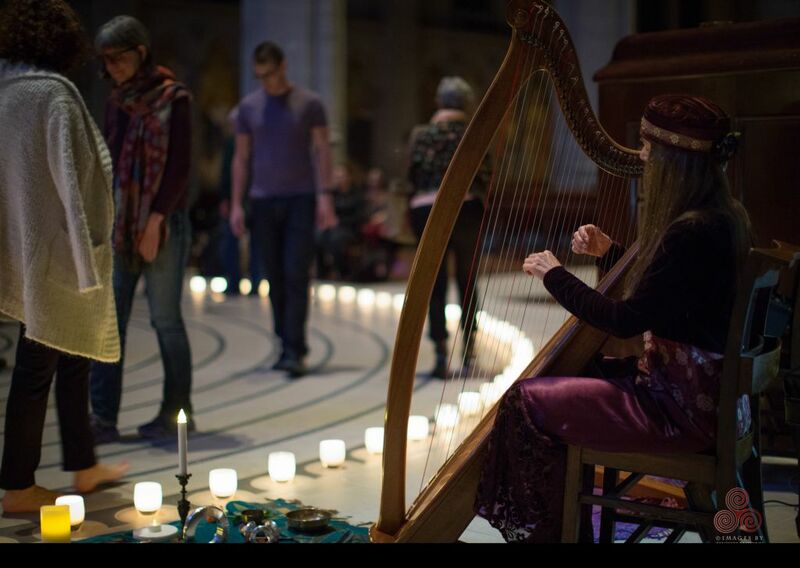 Diana’s harp music creates a harmonious and sacred space for processing grief, for remembrance, and for a celebration of life. Also available is a portable, easily-assembled canvas labyrinth which she can bring to events when labyrinths are not present. A labyrinth can be set up at a funeral or memorial service to help those present to process their grief; or at a wedding to provide the guests with something unique and special to do before the ceremony begins. A labyrinth can be brought to a spiritual service to strengthen prayer and meditation; or to a corporate event to help to gather folks together and focus. Harp Duo for Labyrinths ~ Diana and Portia Diwa Diana has been playing with Harpist Portia Diwa for decades at labyrinths through the World. 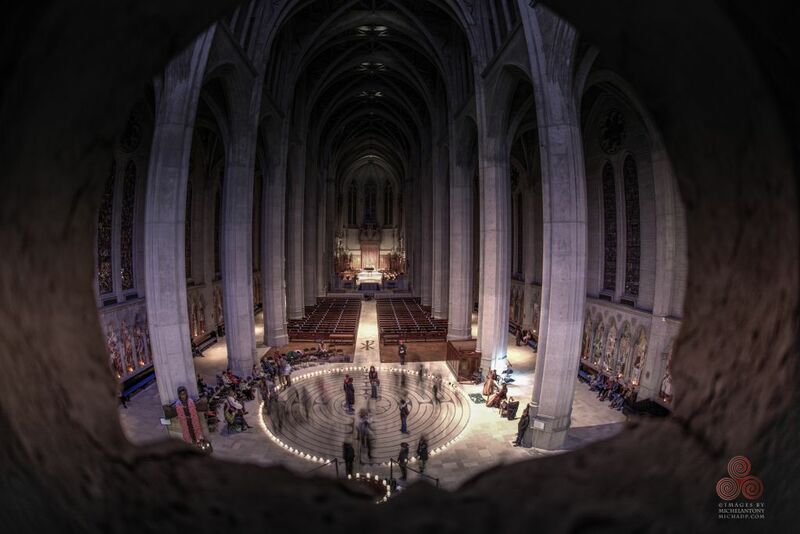 They are featured every year at Grace Cathedral’s popular December Labyrinth Walk. Listen to their harp duo on their CD, Music from the Labyrinth. For a Special Event, they are available to play at your Labyrinth. They can include bringing their canvas labyrinth upon request. Currently, labyrinths are being used as tools for walking meditation, and have only one path to the center. Some labyrinths have as few as 3 circuits, while the Chartres style labyrinth has 12 circuits that form an elaborate meandering pattern, based on sacred geometry. A replica of the Chartres labyrinth is now laid in stone at Grace Cathedral in San Francisco, thanks to the pioneering work of Lauren Artress and Veriditas. For more information about the labyrinth, visit veriditas.org. Labyrinths provide a sacred space for focusing awareness, many kinds of movement, and healing. Listening to music can deepen and enhance your labyrinth experience. Unlike a maze that you can get lost in, there is only one pathway to the center of a labyrinth and one way out – returning to the beginning by the same path. On indoor and outdoor labyrinths there is the possibility for contemplative walking, dancing, and sitting for any period of time in the center. Some people experience the labyrinth in three phases: letting go on the inward journey, receiving in the center, and integrating while exiting the labyrinth. There is no right or wrong way to use a labyrinth. 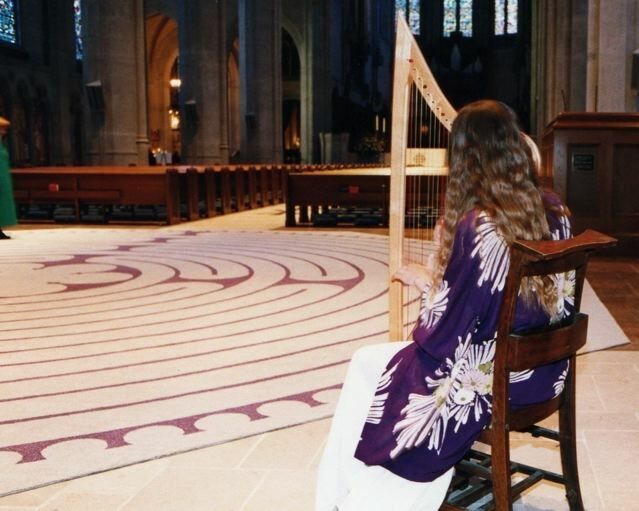 Diana played her harp at the first labyrinth walks at San Francisco’s Grace Cathedral in 1991 on a hand-painted canvas labyrinth. 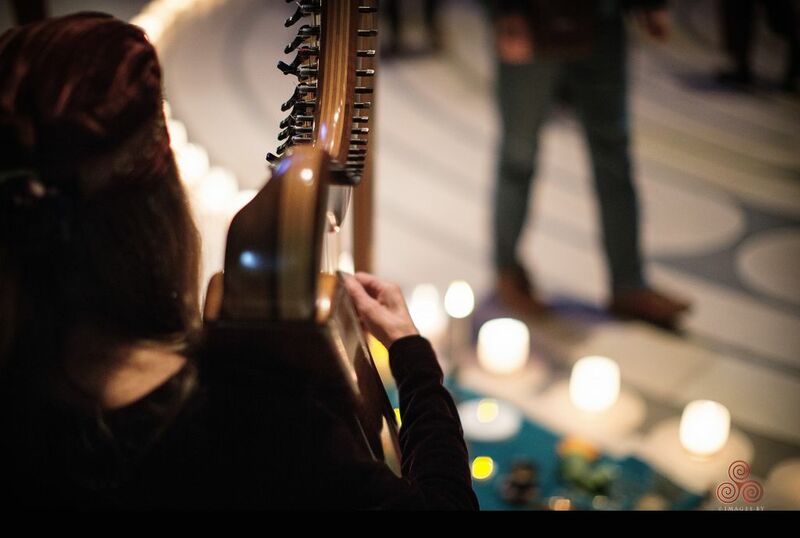 As Labyrinth Director Lauren Artress continued to expand the labyrinth experience at Grace and throughout the world, harpist Portia Diwa joined Diana. 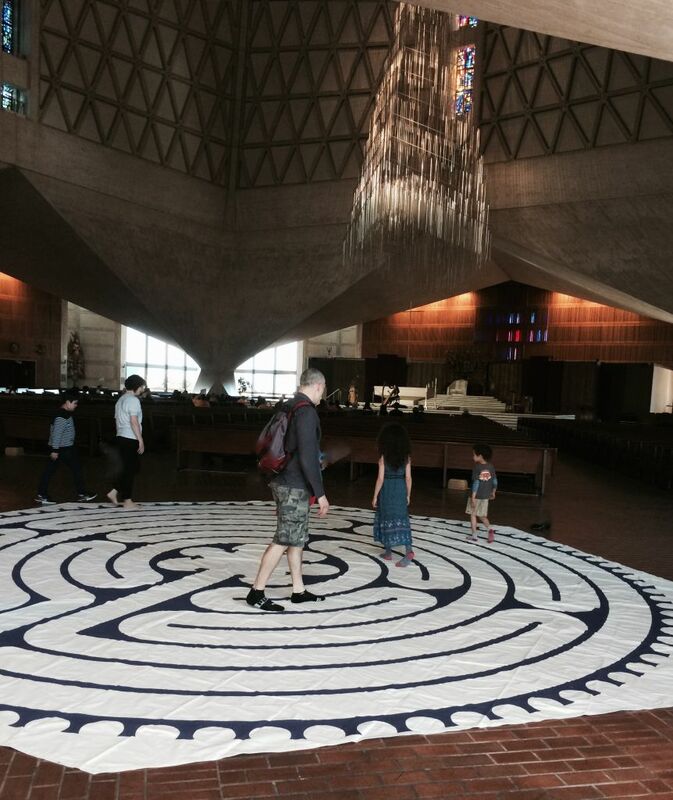 The canvas labyrinth was eventually replaced with a hand-crafted rug; which finally became the beautiful 12-circuit stone labyrinth permanently installed in the floor of Grace Cathedral. 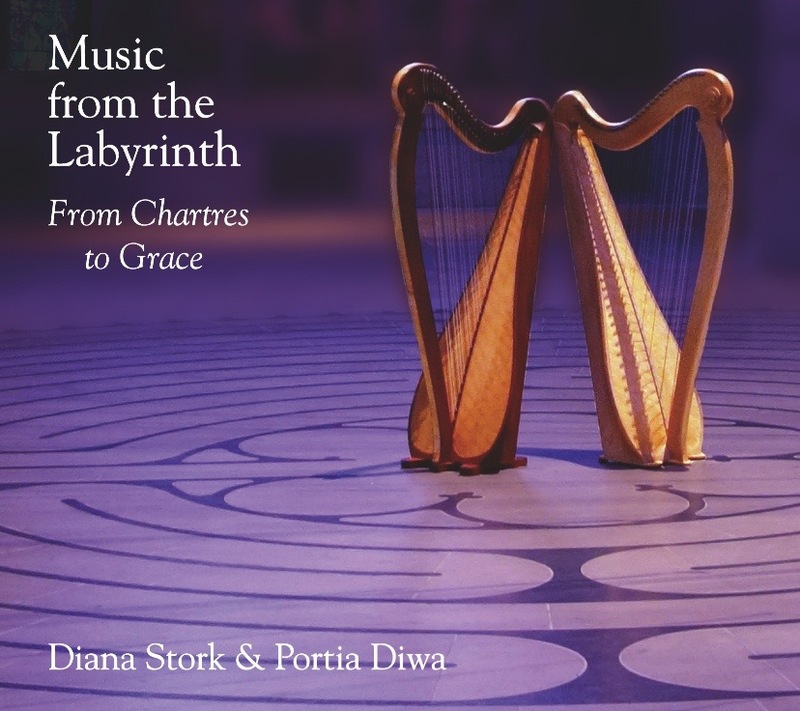 Over their many years of playing at Grace’s indoor and outdoor labyrinths and at labyrinths throughout the world, Diana and Portia have composed and improvised a large body of music inspired by these sites and the people who move through them. On this recording they are joined by San Francisco Bay Area musicians: Shira Kammen on vielle, Dan Reiter on cello, Peter Maund on percussion and Elaine Coombs also on cello. NOTE: CD purchase includes a detachable 4″ square laminated personal labyrinth which can be used for years of labyrinth meditation.